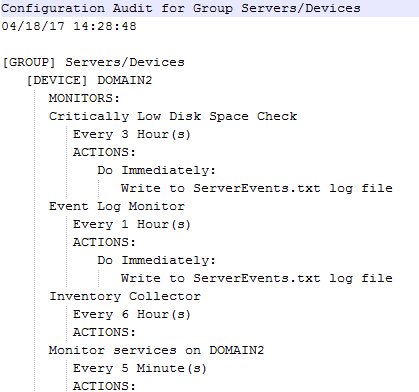 This report shows PA Server Monitor's current configuration, including Groups, Servers, Monitors, and Actions. The report generates a text file listing the Groups with their server and devices. Each server/device will have a list of monitors assigned to them. You can optionally add the monitor's configuration and/or the actions that are attached to the monitors. Watch the training video on how to create a Configuration Audit Report. 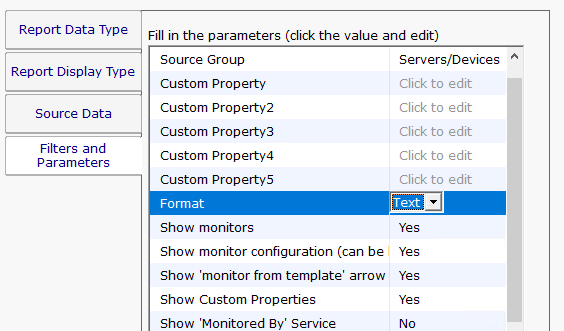 In the example below, the user selects the Configuration Audit report on the top Report Data Type tab. The Configuration Audit report can be found under the System Summary Reports node. The Filters and Parameters tab is most important. A few options let you select what is included in the report; which monitor types, their actions, the monitor's configuration, and source group. Pressing the Generate Report button will display a link indicating where the report was created. You can click the link to open the report in your browser.